Stevens will host its 147th commencement ceremonies at the Meadowlands Expo Center in Secaucus, New Jersey on Wednesday, May 22, 2019. Three generations of alumni gathered to celebrate the golden anniversary of the Stevens Technical Enrichment Program, the university's flagship program to help increase the number of students from underserved communities in STEM fields. The Society of Women Engineers (SWE) at Stevens was recognized by the national society with a Wow! Innovation Challenge award for its K-12 STEM outreach efforts. At Stevens, we are committed to providing students with a supportive and inclusive campus environment that promotes respect for individual differences and is free from discrimination. We value diversity and inclusion and understand the vital role they play in creating a vibrant and enriching campus culture. Theta Xi Fraternity Gamma Chapter was awarded the Memorial Trophy, which is given only to the top performing chapter in the country. The outstanding recognition is a symbol of the chapter's commitment to excellence and a prime example of what it means to be a Stevens Greek. Being part of the Stevens community is more than about earning a degree. It’s about forming life-long friendships, learning to care for others through service, balancing classroom time with physical activity, exploring your curiosities and pursuing your passions by joining a club, learning from and appreciating different points of view, and most of all – knowing that an entire community has your back. A comprehensive network of support services is always on hand to help our students succeed and realize their full potential. Deciding where you will live is one of the first decisions you'll make as an official Stevens student. 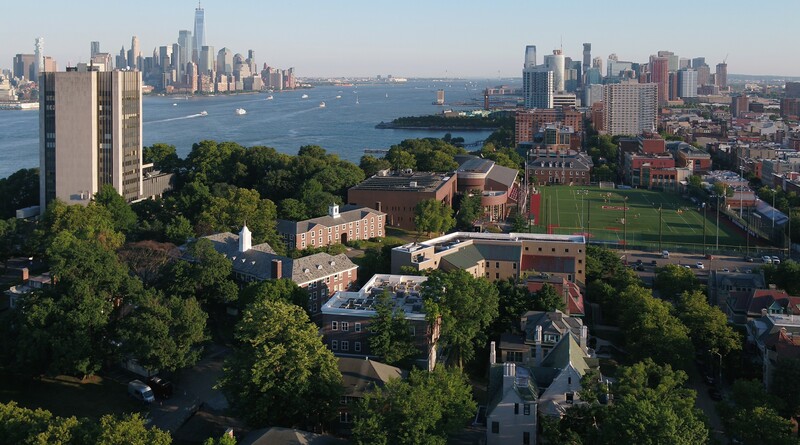 Stevens offers seven on-campus residence halls, three types of special interest housing and 10 leased properties located throughout Hoboken — all conveniently located on or near campus. Living on campus is one of the most exciting aspects of attending Stevens. Located in the beautiful city of Hoboken, Stevens sits at the epicenter of education, culture, technology, and social life. Students live in on-campus residence halls, special interest housing, as well as apartments in Hoboken. The close proximity to New York City offers professional opportunities, social engagement, cultural institutions, and so much more. Nicknamed the Mile Square City for its compact size, Hoboken offers an urban lifestyle with a small town feel. You'll find diverse and unique restaurants and shops, a thriving arts scene and plenty of green space for your favorite outdoor activities. Stevens is a vibrant community home to more than 100 student clubs and organizations from student government, fraternity and sorority life, community service and more! With over 100 organizations on campus, you are bound to find one that meets your needs. If not, you can always start one! Stevens has a long and illustrious history of supporting sororities and fraternities, spanning over 145 years. "At Stevens, I’ve been taught the most important engineering of all: engineering your life. I’ve met amazing people, interned at my dream companies and grown outside of the classroom." "Life outside of the classroom has developed me as a friend, a leader and person. I’ve learned what it means to serve and to lead, to relax and to stress, and enjoy every minute that I can here." "Because of the opportunities outside of classes, I have been able to grow as a person, becoming more confident, involved and dedicated to everything I am a part in." At Stevens, we empower our students to reach their fullest potential by promoting healthy behaviors. Our goal is to educate students about healthy behaviors to develop habits and practices that span well beyond their college years. The health and well-being of our students is of paramount concern, underscoring the university’s clear and unwavering focus on our students. Staffed by a physician and registered nurses, our on-campus health center is available to all enrolled students. At our recreation facilities, students can join group fitness classes, lift weights at the gym, swim laps and more. Counseling Services provides personal and group counseling services to students. Services are free and confidential. Honesty and integrity are long-standing values maintained in all aspects of university life. The Stevens Honor System encourages students and faculty to collaborate in upholding the university’s reputation for academic excellence. Founded in 1908 as the first student-run honor system at an engineering college, it has defined Stevens’ culture as one of trust and fair play. All members of the community, guided by a peer-elected group of students known as the Honor Board, are responsible for maintaining and promoting integrity needed in both academia and the professional world. The Stevens Career Center is dedicated to empowering students to succeed in obtaining career outcomes appropriate to their academic studies and personal goals through career exploration programs, experiential education opportunities, and individualized guidance from the Career Center staff. Career advisors engage with students starting from their first semester at Stevens through graduation by providing career planning and professional development workshops, corporate site visits, and a variety of on-campus recruitment opportunities throughout the academic year. The Center partners with corporate, government, and non-profit employers in their efforts to recruit top talent for their organizations. The Stevens Career Center is dedicated to assisting students gain the professional experience necessary to secure employment related to their academic studies through experiential learning opportunities.